Which server you choose is VERY important. Any other changes? Did you have to configure VLAN Tagging? Mine must be set up differently. Worked out of the box without VLAN Tagging. And in fact, does not work when I try the above setting. Ceases to connect to the internet and asks for authentication of some sort. 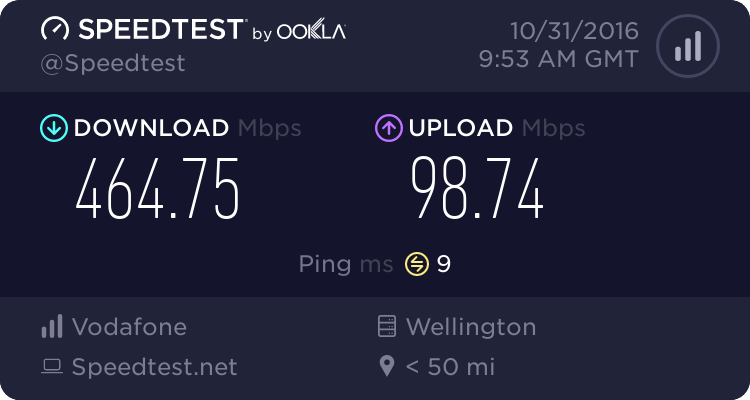 Still only getting around 500-600Mbps connection via the HG659 to R7000. Right, so now I've removed that part of the chain. VLAN tagging now works. However, seems to have pulled some speed out of it. Gone down by 200Mbps. I'll leave it like this and test some more tomorrow but if it's faster with the HG in the chain doing nothing other than bridging, then I'll put it back in. @Jamie1990 why are you taking screen shots of the results? why not just click the share results link next to the big test again button then copy the forum link and paste it in this thread. much easier and faster and it also removes your IP address from the image. @geoffwnz why did/do you have the Hg659b going into the r7000? That might be it -when I did the test with the Huawei router, I selected the 5G ac wireless, I've set my R7000 up with the intelligent beamforming+ - (no seperate 2.5 & 5Ghz wireless - both use same SSID and it intelligently switches) so it's probably using the 2.4Ghz n network primarily rather than the 5Ghz ac. Mis-reading/misunderstanding the setup. Somehow got it in my head that you had to keep the HG659 in the chain. Might instead use it in the garage to replace the older WRT-54GL that's acting as an extended wireless access point. Running the HG659 should give me better speed in the garage (even via a Wifi connection back to the main router), plus 5GHz which the WRT-54GL doesn't do. Yeah, given the speed increase, might pay to investigate that. Given 90% of devices connect via those old fashioned wire thingys and I only wifi my phones, the slightly lower performance on 2.4GHz wifi shouldn't be too much of an issue. Wow! You are still using one of the original WRT legend. Running the Linksys / Cisco OS, or Open WRT? Yeah, it was the main router for a while but I think I cooked it by running the power too high for years. Running DD-WRT I believe. Been so long since I've done anything other than power cycle it from the power plug that I have no idea what it's even doing. But I know it's still working as the phone switches to that when I head into the garage (separate building from the house). Another night done, another 4 nodes upgraded. Only a few more weeks to go and it will be full on for the docsis 3.1 upgrades. I see it being a massive improvement from docsis 3.0. Since the node change I've had no buffering at my place running the standard technicolor on a 50/2 connection. CableGuyChch: Another night done, another 4 nodes upgraded. Only a few more weeks to go and it will be full on for the docsis 3.1 upgrades. I see it being a massive improvement from docsis 3.0. 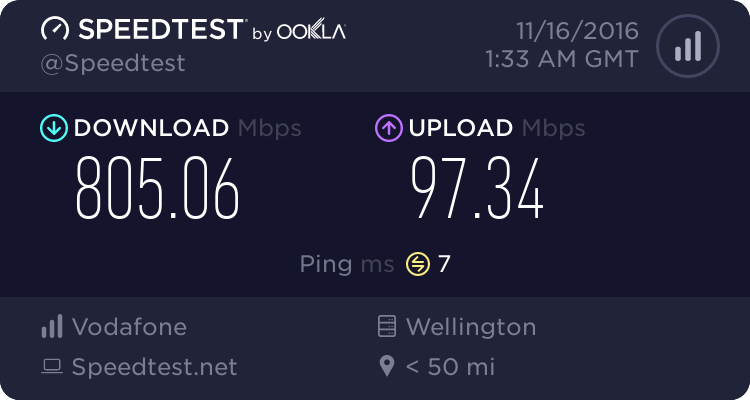 Since the node change I've had no buffering at my place running the standard technicolor on a 50/2 connection. Over Sydenham way and at the base of the hills. Unsure when Vodafone will release it for that area as testing will be commencing first.